Mvix, the market leader in digital signage systems, has announced a partnership with the Fremont School District to equip digital signage and menu board systems at its new facilities. This type of partnership is a rising trend with school districts, seeking innovative ways to improve efficiency. 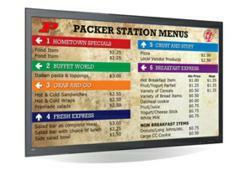 Mvix, the market leader in digital signage systems, has announced a partnership with the Fremont School District. The district resides in Fremont, Michigan and serves two high schools, one middle school and two elementary schools. This type of partnership is a rising trend with school districts, seeking innovative ways to improve efficiency. For Fremont School District, the timing was perfect. A new high school was set to open in fall 2012. Rick Webb, the district’s Director of Technology was charged with the task. “That summer, our department had a lot to take on with opening a new building,” says Webb. “We were in the process of moving our equipment to the new building, installing a new data center and replacing the entire phone system – all in one summer.” Even though the district was overwhelmed with work, they hoped that digital signage would improve future efficiency. Like most schools, Fremont was using static menu options and wanted to improve the flow of traffic during the lunchtime hour. After speaking with several companies, Webb decided to select Mvix. “The main reason we selected Mvix was the feature set availability at a low price point,” says Webb. “They were probably 15 to 20 percent lower on costs than other options with similar features.” Also, the installation process was easy and Webb was able to get the support he needed during a very busy time. “The support has been good,” says Webb. “Every time I’ve reached out, we’ve gotten what we needed.” The district can upload a 40-day lunch menu rotation, which takes about an hour to accomplish.